As fall approaches, the ranch starts thinking about the opportune time to precondition and wean the calves. The drought during the past years has made Harding Land & Cattle Company Management strongly consider weaning the calves earlier than usual, in an effort to save grass in the pastures and allow the cows to store flesh for the coming winter. 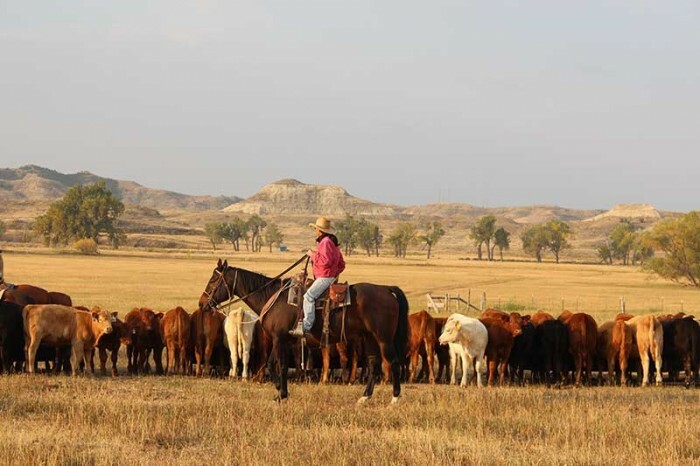 A set of corrals, located six miles straight north of headquarters and known as “cow camp,” is greatly utilized during the fall activities of gathering, preconditioning and weaning. During a normal fall, all of the calves were weaned at the ranch. After being hayed, the meadows west of headquarters offered the ideal place to keep the calves, while feeding them a ration of weaning pellets. Because the calves are not confined in the corrals, sickness is virtually unheard of. The location that the calves are weaned, and the means by which it is done, can change from year to year – as different circumstances are adapted to. During the fall of 2006, nearly 500 calves were weaned and hauled 30 miles to the feedlot near Terry, in one day. This was done from the corrals at cow camp. After the calves are shipped to the feedlot near Terry, MT, the pace at the ranch slows somewhat. The weather starts to become cooler and the days grow shorter. The weather and the amount of grass determine how late fall grazing can be carried on. An early November snowstorm can bring an end to the grazing season and facilitate a start to the feeding season in a real hurry. By the middle of December, regardless of the weather, all of the cattle are usually being fed hay. A ration of 30 pounds of hay per cow per day is fed, depending on the temperatures and wind-chill factors. Harding Land & Cattle Company headquarters unit (as mentioned previously) includes an enclosed calving facility with a vet room and heated delivery and chute area. Also at the headquarters is a heated shop with a full concrete feed and storage room attached to it. The large ranch house is still there and fully functional along with two log cabins that date back to the turn of the 20th Century. Visit MontanaBeef.com for more details! 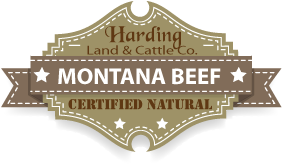 Harding Land & Cattle Company employees participate, and are certified in, the Beef Quality Assurance (BQA) program.